So, yesterday morning I sat down, wrote a whole blog post, as I was getting ready to post it live, then the whole thing erased. The whole darn thing. And no matter how many times I pressed edit undo, it still wouldn't come back. So I walked away in frustration and immediately sent an upset/angry text to my husband saying I am never blogging again. Ha ha. Well, here I am again today with attempt number two. After a month of not blogging because I haven't had any inspiration or anything interesting to really write about, yesterday's failure wasn't very encouraging. But, after a long walk this morning with just the dog (kids are back in school now), and a second cup of coffee to myself that was actually still hot, I decided that I need to just make it happen. My iPhoto is becoming backlogged with so many exciting and new photos of recipes I cannot wait to share with you all. As I photograph food, I always think about how exited I am share it with the world. But, when it comes down to sitting in front of the computer with an empty text document in front of me, my mind seems to go blank. What do I talk about- the weather? Boring! Life is always crazy busy, but it's my crazy busy, and probably isn't very interesting for anyone else to read about. Besides, you all want the recipes, not my whole life story! With that said, I am going to move on to this fabulous pie now. My oldest daughter and I are actually the only ones in our family that eat cherries. But, that didn't stop my from making a pie with them. More pie for the two of us, right? This pie was everything I hoped it would be. 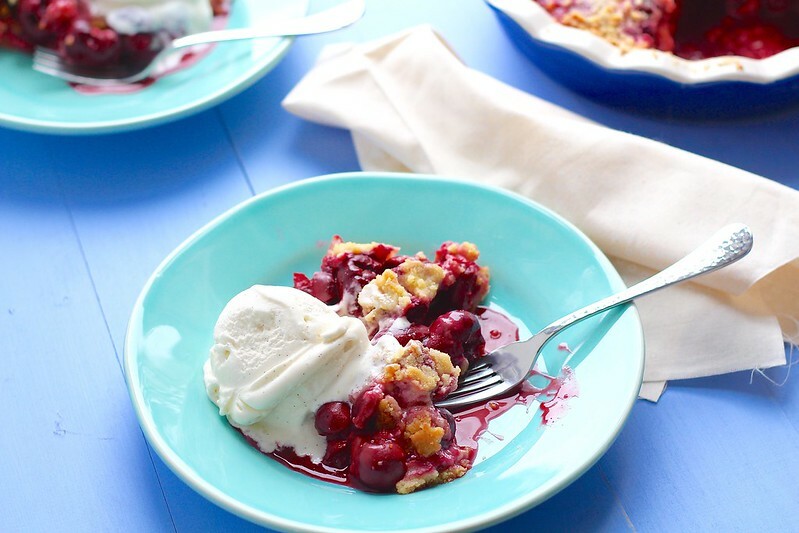 The perfect amount of sweetness to offset the semi-tart cherries in a buttery, flaky pie crust, sprinkled with my favorite streusel topping. Served warm with a big scoop of homemade vanilla ice cream, and we are in serious business. And you can't forget to sing "she's my cherry pie" when you're making it. 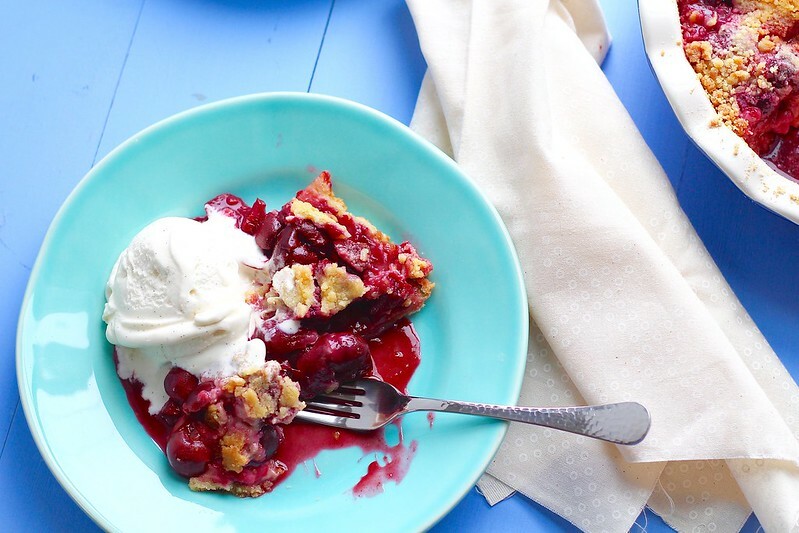 Perhaps the perfect pie to end the summer fruit on? To make the crust, whisk the flour, salt and sugar together in a medium bowl. Toss the butter pieces in to coat with flour. Then, cut the butter in with a pastry blender until the butter is mostly mixed in, and no large pieces remain. Combine the water, cider vinegar and ice in a liquid measuring cup. Sprinkle 2 tablespoons of the liquid over the flour mixture, and mix in with a spatula until incorporated. Continue the process, with 1 tablespoon of liquid at a time, until the dough comes together into a ball and only a few shaggy bits remain. Flatten into a disc, wrap with plastic wrap, and refrigerate for 1-2 hours. Once the dough has chilled, roll it out to fit a 9-inch pie plate. Place in the pie plate, trim any excess and crimp the edges. Freeze for about 15 minutes. Preheat the oven to 425ºF. Place a rimmed baking sheet on the middle rack. 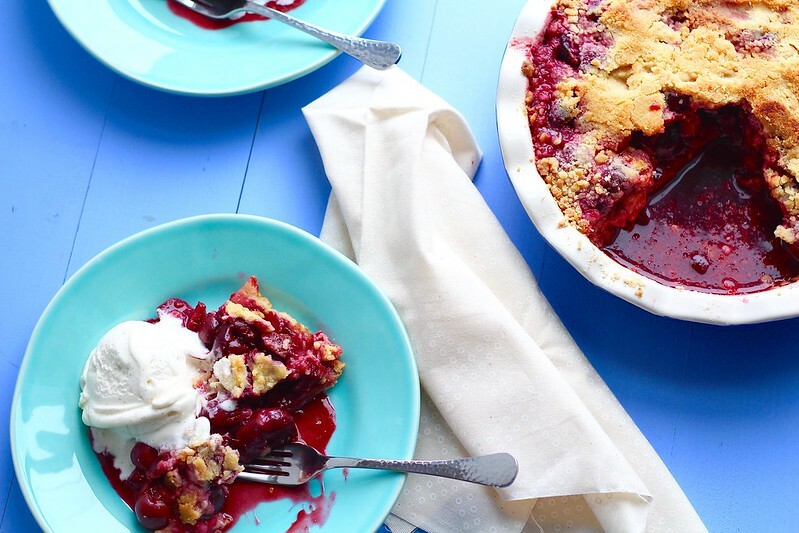 Using a fork, prick the bottom of the pie crust all over about 20 times, to prevent air bubbles when baking. Press a large piece of tinfoil in and around the crust. Fill the now lined crust with pie weights, or dry beans. Place on the rimmed baking sheet in the preheated oven and bake for 20 minutes to partially pre-bake the crust. Remove from the oven and place on a wire cooling rack. Remove the weights and tinfoil and let the crust cool completely before filling. For the streusel topping, whisk together the flour, brown sugar, granulated sugar and salt in a medium bowl. Toss in the butter pieces to coat with flour. Rub the butter in with your fingertips until there are no pieces bigger than a pea. Place in the refrigerator and chill for at least 15 minutes before using. Preheat the oven to 425ºF. Place a rimmed baking sheet on the middle rack. To make the filling, grate the apple on the large holes of a box grater. In a large bowl, combine the grated apple, pitted cherries, lemon juice, brown sugar, potato starch, cinnamon, cardamom, and bitters. Gently toss to combine. Pour the filling into the cooled pie crust. Sprinkle the streusel topping evenly over the top. 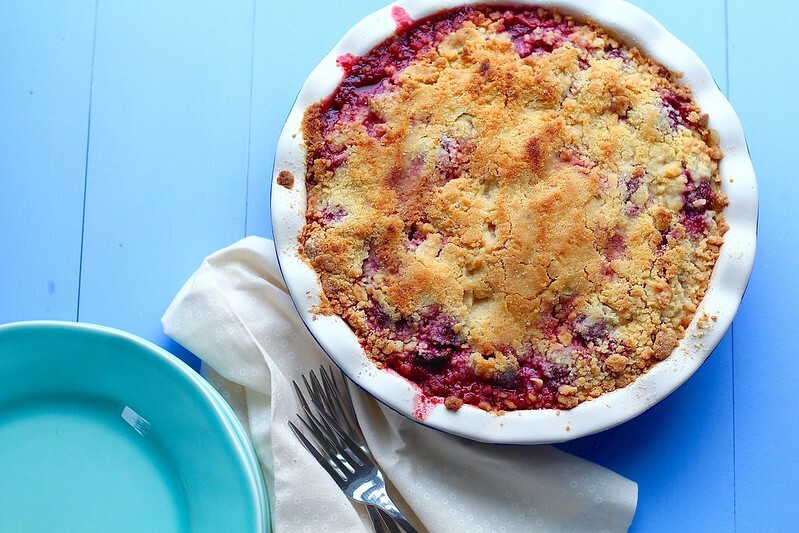 Place the pie on the rimmed baking sheet and bake for 20 minutes. Lower the oven temperature to 375ºF, and bake for another 30-35 minutes longer, or until the filling is bubbly and crust is golden brown. Place the pie on a wire rack, and let cool for 2 hours before serving. Serve slightly warm with vanilla ice cream or softly whipped cream if desired. *Look in the liquor isle by the cocktail items for the Angostura bitters. If you don't want to purchase it, then just omit it completely from the recipe and proceed as directed.